From today, Windows 10 users will be able to download the free April 2018 update for the operating system, with an official rollout to PCs around the world scheduled to commence on May 8, 2018. 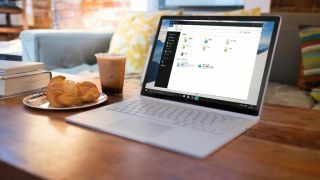 Announced via a blog post by Microsoft's corporate vice president Yusuf Mehdi, the update promises a host of new features, many of which are said to streamline your Windows experience and save you time while working. The new Timeline feature allows users to send their PCs back in time up to 30 days in order to find missing files, documents or projects, meaning you'll be able to return to what you were doing weeks ago in an instant via automatic save states or by search. Best of all, the Timeline feature will work across your iOS or Android devices while using Microsoft Edge or Office 365. Also introduced with the update is the new Focus Assist feature, which will provide users with a detailed summary of what they missed while they were goofing off on social media, including emails, notifications or updates. Focus Assist can be switched on when necessary, or set up for specific times if you're looking to get some work done without any distractions. Microsoft Edge has also been updated, with the browser receiving a variety of new features, including the ability to mute (or unmute) individual tabs by simply clicking on the tab's audio icon. It also has the ability to view books, PDFs and reading pages in full-screen, autofill options on web payment forms, and even a built-in Grammar Tools button to aid in reading comprehension. If you've been meaning to take advantage of Windows 10's voice assistant Cortana, you're in luck – the update's new Dictation feature makes it easier to capture your thoughts in a quick and accurate manner. To start Dictation mode, set your cursor in a text field, then press Win+H and start talking, then watch your words appear on screen. Of course, these are just some of the new features set to arrive in the latest Windows 10 update, with simplified IT management tools for enterprise users, new creative features for Photos, 3D and Windows Mixed Reality and new security enhancements also on the agenda.